What are Farm Advisory Boards? A farm advisory board is a group of six to eight people who get together regularly to help manage a farm business. It is generally made-up of members of the family plus one or two of their key, trusted advisors. Farm Advisory Boards provide a structured process for farm families to discuss key business management decisions such as finance, land purchase or leasing opportunities and machinery replacement, just to name a few. Advisory Boards are different to Boards of Management (required for company structures). In an Advisory Board, members are there to provide ‘advice’ only, and it is up to the business partners/legal owners to make the final decision. This provides some level of comfort for farm family members, as all the final decisions still remain the responsibility of the farm business owners. What might a Farm Advisory Board discuss? Agendas for farm advisory board meetings are set by the chair in cooperation with the farming family, and should be circulated to all advisory board members at least one week prior to a meeting. How do I know if I need a farm advisory board? Farm Advisory Board meetings provide the business with a dedicated forum where time is spent discussing the business in a structured way. if you are not adequately meeting the legal responsibilities of the business, then a farm advisory board may be the answer. What are the advantages to establishing a farm advisory board? 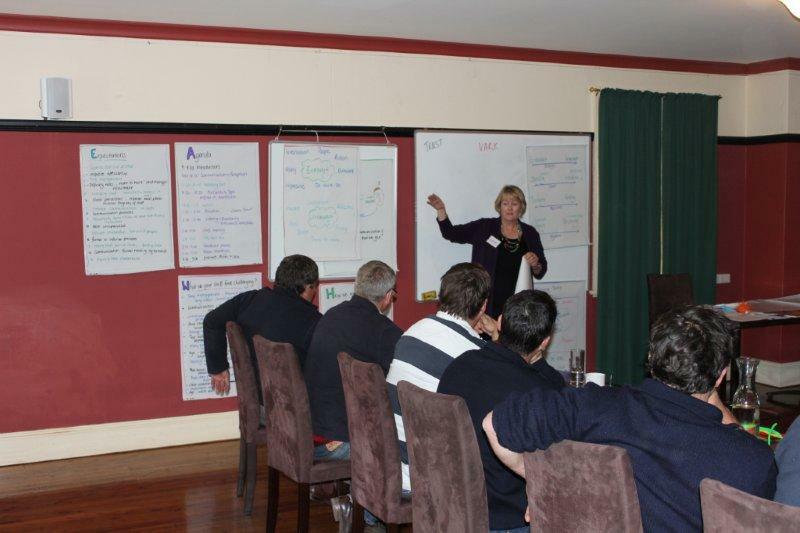 Farm Advisory Board meetings provide farm business partners with the rigor and time to strategically review the direction of their business, and time to prioritise the key tasks for the business, outside operational deadlines. They provide an opportunity for all members of the farm business to have a say in a formal environment, on key strategic decisions for the business. They also provide a place for the next generation to learn the ‘business side’ of the farm, with the full support of the older generation and their trusted advisors. Boards of management are key risk management tools for many businesses outside of agriculture. Boards, advisory or management, mean that more than one person knows the direction and operation of the business, and there are processes and plans in place to ensure business continuance should something happen to key family members. What are the disadvantages to establishing a farm advisory board? Often as sole operators, the thought of sharing the decision making in a family farming business is uncomfortable. This is perceived to be one of the biggest disadvantages in a family business, but once in operation, most farm families with boards, believe this is one of its greatest advantages. It is often the time pressures on collecting the relevant information and hosting a board meeting that is the hardest issue for businesses with farm advisory boards. If you are committed to the process, then the benefits of creating these reports, and spending the time, far outweigh the hassles. Do I need to pay the independent advisory board member? Yes. Most professionals will charge their normal daily rate for preparation and meeting time. Meeting expenses, such as board room hire, independent board member travel, morning and afternoon tea costs, should be met by the farm business. Using technology for workshops is something I have been doing for many years, running webinars and having guest speakers Skype into a workshop session. Earlier this year we attempted this differently with one of our participants, Jeanette Gellard, joining on Skype from South Korea for a full two days. Quite an achievement for Jeanette when the rest of the group were all face to face in a rather noisy room in a city hotel and the workshop was very interactive! We simply connected the iPad to a speaker and had a headset on hand for practice activities. Fortunately the internet didn’t let us down and the participant enjoyed the experience and the interaction with the group. Here are Jeanette’s comments about the experience….. When is too far away, really too far way? Over the last few years I’ve come to realise that the answer to that question is, Never! Thanks to the development of our communications technology, distance no longer needs to be the barrier that it once was. Skype, Facetime, Viber, Twitter, Instagram, Linkedin, GoTo Meeting and a plethora of other software programs and applications make it relatively easy to stay connected to others. Whether its video, audio, text or image based our capacity to communicate with others and participate in events is really only limited by our access to a good quality internet connection and a device that runs the relevant program or application. Living in South Korea I have the privilege of being able to access some of the fastest internet connections in the world. What this means in a practical sense is that I get high quality video streamed through my computer or smart-phone which allows me to participate ‘virtually’ in a range of activities from workshops and study tutorials to conversations with friends and family ‘over a cup of coffee’. Over the past six months I’ve ‘attended’ two workshops in Adelaide, South Australia from the comfort of my apartment in Busan, South Korea, some 7,853 km away! Both events were successful from my perspective due to the following key elements. The acceptance of the other workshop participants in having a ‘virtual’ classmate and their willingness to engage with me on a one-on-one basis using the available technology. This included participants randomly ‘dropping by’ to chat with me during workshop breaks. Being included in group photos! From my end there were a couple of things that I put in place to ensure that my participation would be as positive as possible. When planning any training or extension events for adults consider what’s important for them to learn. The pioneer of adult learning was Malcolm Knowles, he identified the six principles of adult learning provided below. Encourage adults to take an active role in their own learning. Recognise their individual motivations for participating and remember we resist learning when we feel forced to participate. Time spent establishing the group at the beginning to build trust is time well spent. It builds rapport with you as the facilitator/trainer and with the other members of the group encouraging participants to be actively involved. It can also provide an insight into the individuals motivations for attending. Encourage participants to share and explore ideas before providing the facts. Give constructive useful feedback – however, before doing this check in with the participants to ensure they are open to receiving it. Choose activities that are relevant to the participants work and life. 2. Adults bring life experiences and knowledge to learning experiences. This may include work-related activities, family, previous education and general life experience. Ask them to share their experiences about the topic and help them to connect their learnings with their work/life experiences. Listen carefully to the experiences shared and relate this to the theory. Adults learn as much from others in the room as they do from the trainer – provide opportunities to talk and share experiences. Ask them about their personal expectations / goals for the activity. Record these and reflect back on them during the workshop – are their goals being met? Check in at the end of the workshop to see if they have been achieved. Be clear about your goals and outcomes for the workshop/activity. Show them how specific learning experiences may fit with their goals. Provide choices for participants where appropriate so they can choose what they consider to be the most relevant to their circumstances. Explain the relevance of activities you ask participants to do. Relate theory to practical experiences and outcomes. Provide them with opportunities to visit trials or demonstrations – get them out in the field. Include speakers who have been successful in applying the theory to explain or show how it worked in their circumstances. Include practical activities where ever possible. No-one likes to sit and listen all day! Especially farmers who are used to being active and outside. 6. Adult learners like to be respected for the considerable life experiences they bring. Provide opportunities for them to voice their own opinions. Let them plan their next steps and take responsibility for their learning journey. Provide support through coaching and mentoring. Finally adults come along to training events and activities to network and meet other like minded people. Ensure everyone has the chance to introduce themselves to the group, provide clear easy to read name tags and allow time in the breaks for networking. I was asked recently what a facilitator should have in their toolkit. 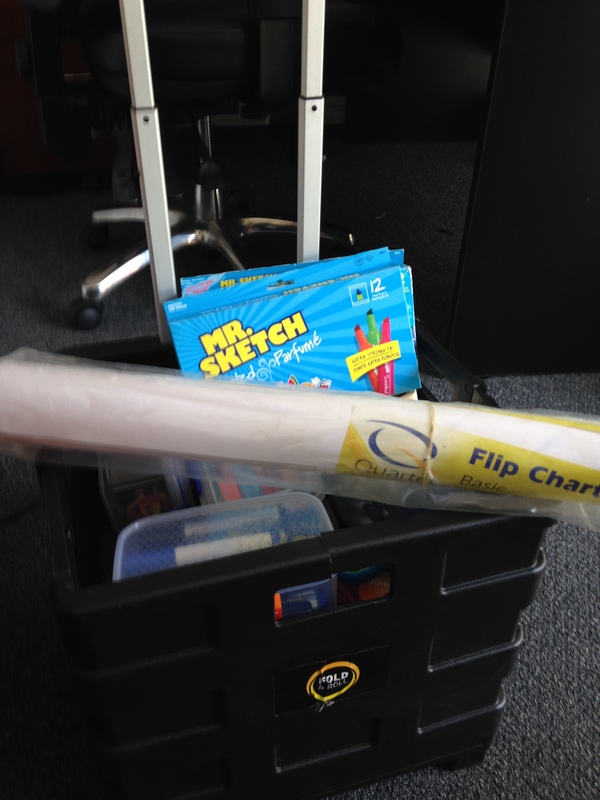 Hence today I thought I would go back to basics.. what does the facilitator/trainer need in their tool box? Masking tape – great for name tags, it stays on rather than falling off! A clear clock to put on the desk so its easy to keep track of the time without looking constantly at our watch! And to easily move all of this about, a box on wheels is very useful.What else do people have in their toolkit? In the last two weeks I have attended two very contrasting workshops. Both were delivered by internationally recognised speakers, both with very different energy impacts and outcomes for me, as the participant. The first was delivered by a motivational keynote speaker. It was high energy and high impact, I left each day with my head buzzing, excited by what I had learned and looking forward to the following day. I even had trouble sleeping at night as the concepts were rolling around in my head keeping me awake. Since leaving the workshop (now nearly two weeks ago) I am still thinking about what I learnt and how I can apply into my work. I left the second workshop feeling grounded and rather tired. The presenter didn’t provide energy from the front of the room and wasn’t able to extract the energy from the participants either. I’m sorry to say I would be unable to recall some of the main points from this workshop and it was more recent that the first. There were some similarities between the speakers – both were passionate about their topic, both delivered a similar number of points in the same timeframe, both used stories and both asked us to discuss their key points with the person beside us. A similar workshop framework being used and yet such a different impact on me as the participant. What did I take away from this experience – it was an important reminder that we learn and remember more when the learning is attached to emotion. Emotion for me is connected to the energy and enthusiasm of the presenter. I’m not suggesting we should all go over the top and be “cheerleaders”. However we do need to think about our own energy levels and the impact we are having on our participants. What works for us will not work for everyone. Experiment with your own energy level at the front of the room, watch and monitor the group reactions. From now on when I develop my session plans I will include a new column “energy” and determine for each section the energy level I believe is required and how this can be achieved for the group. Varying the energy level throughout the day to maximise learning, I will also include this in my personal workshop review. I would be interested in your comments about the energy levels of presenters – when does it become exhausting? what is too much or too little? How do you change your energy for groups? How many of you have been to Bali? Yes I have been to Bali too! I was there a couple of weeks ago with my four beautiful children. While we were there my oldest daughter and I visited a butterfly farm and in the nursery we were able to witness butterflies emerging from their Chrysalis, it was an amazing experience. What does a butterfly farm have to do with Mentoring? As I pondered on what I gained from being a mentor it hit me that one of the most rewarding aspects for me is watching my mentee transform as does a butterfly. So how did I end up being a mentor? In 2004 I was fortunate to win a bursary to attend the Rural Congress for Women in Spain and as part of that experience I set myself a goal to give back to industry that had supported me to attend. The first step was, as a volunteer, to join a National Reference Group. 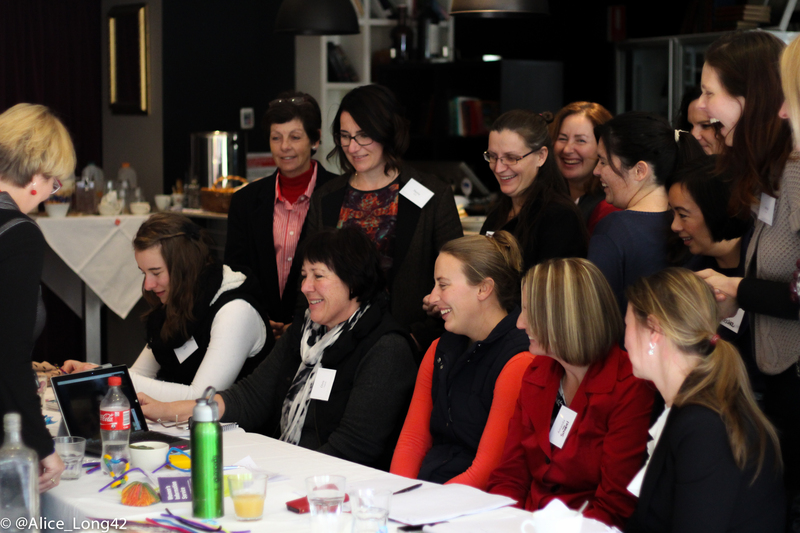 At one of the first meetings in Melbourne we had a guest presenter on Mentoring. My eyes lit up, what a wonderful way to give back to industry; however what I wanted to know was what underpinned being a great mentor? The lady who presented at the meeting shared that for her it was the art of coaching, so full of enthusiasm, I promptly did some research and enrolled to complete coaching training, from that day forward the coach approach has underpinned the way I facilitate, deliver workshops and mentor. There are several significant people in my life who have believed in me and given me the confidence to give something new a go. They also have challenged my thinking. On reflection this would have been what I refer to as INFORMAL mentoring. The downside for me of informal mentoring is that often the relationship is not declared as a mentor/mentee relationship. In fact sometimes INFORMAL mentoring may simply be that I have chosen some-one that I admire to role model myself on or I may choose to support some-one who I can see potential in. 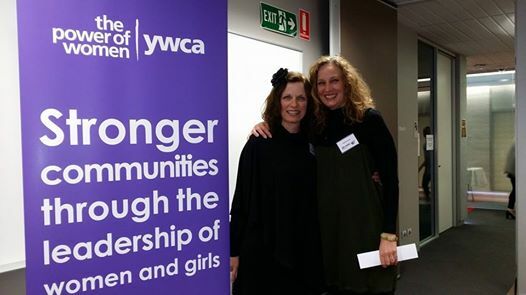 This year I was a Mentor for the YWCA SHE Leads Program. What excited me about the YWCA program is that it’s a FORMAL Mentoring Program. As a volunteer I appreciated that it gave me a start and a finish point. Our relationship was declared and I was very privileged and honoured to be partnered with Dr. Lisa Bailey, Programs Manager, RiAus. This gave us the opportunity to discuss how we were going to work together giving our relationship the best opportunity to be beneficial to Lisa. For example we discussed: what were Lisa’s goals, what motivated her, what were her current challenges, where we were going to meet, when we were going to meet, how we were were going to communicate. Also for Lisa how will she know our relationship has been of value? For me also because Lisa was sponsored by her workplace it was important Lisa, her Manager and myself met to discuss what his expectations were and also the importance of confidentiality in our relationship. It is my understanding if someone attends a workshop and then returns home or to the workplace if they do not implement their learnings 80% of that knowledge is lost in 3 months. When you are looking at Return on Investment that is a scary statistic. Adding coaching or in YWCA’s instance mentoring to a program enables participants to retain up to 90% of their learnings. Speaking of learnings, I enjoy bringing my own learnings to Mentoring, whether they are good or bad. As Mentor I bring wisdom, however it is important the Mentee learns by finding their own solutions. An example is that as we support our mentees in reaching for the stars, ask them to take a moment to think about what if things don’t pan out how they had planned. What are their contingency plans? When I first met Lisa I thought wow I know nothing about science and I have been paired with someone from a pure science background. This brings me to something else I value about mentoring. The skills and strengths I bring to a mentoring relationship doesn’t have to be within my industry, it can be across any industry, and by doing this, it keeps me fresh because the way I think is being constantly challenged. In summing up what Mentoring gives to me – It is much more than the transfer of knowledge and insights. I am passionate about women developing their leadership skills and if I can support some-one to reach their goals then I will beam from ear to ear. Mentoring gives me the opportunity to reflect on my own goals, practices and learnings and deepens my personal leadership and coaching style, it challenges my thinking and keeps me fresh. To all the prospective Mentors and Mentees may you do as a butterfly does …. emerge and spread your wings. A reminder of what not to do.. Sometimes I need reminding by a group of participants about the “What not to do at the front of the room”. 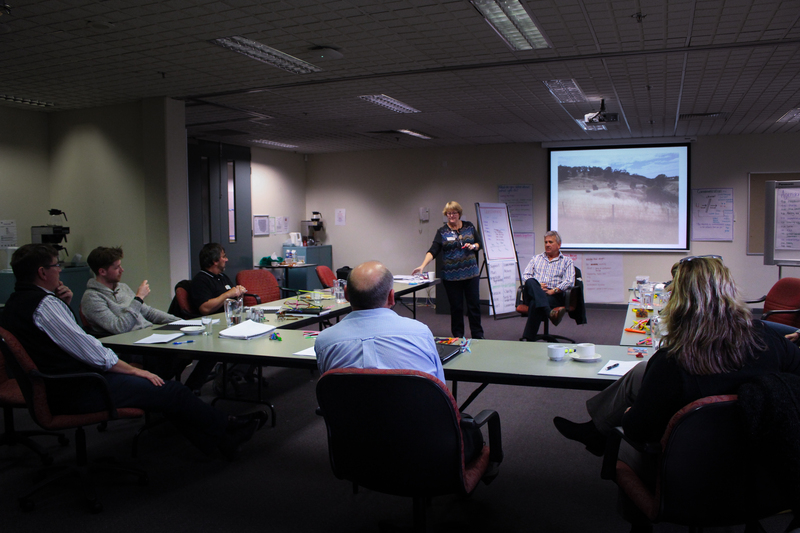 I recently attended a Australasia Pacific Extension Network (APEN) Roadshow – “Designing Effective Events … by understanding how adults learn” facilitated by Andrew Huffer. One of the discussion points was what are some of the things we dislike from presenters – the things we should take note of and change! There was nothing really new however some good reminders so we make all of our presentations “Wow”. Repetitious behaviour such as jiggling keys or coins in your pocket or swaying – something to be aware of when we are nervous. The key jiggling seems to be more common with males, because of pants with pockets containing the keys rather than handbags I suspect. Participants report finding this type of behaviour distracting. Too many acronyms, only those in the know know them! Avoid acronyms were possible or write them in full. Overload of too much complex data. Remember the famous quote “Everything should be made as simple as possible, but not simpler,” Albert Einstein. The complex data may be very meaningful to you, however, what are the key messages you need your audience to take away. I’m sure my readers have many other “What’s not to do’s” and I would love you to add some comments to this blog. 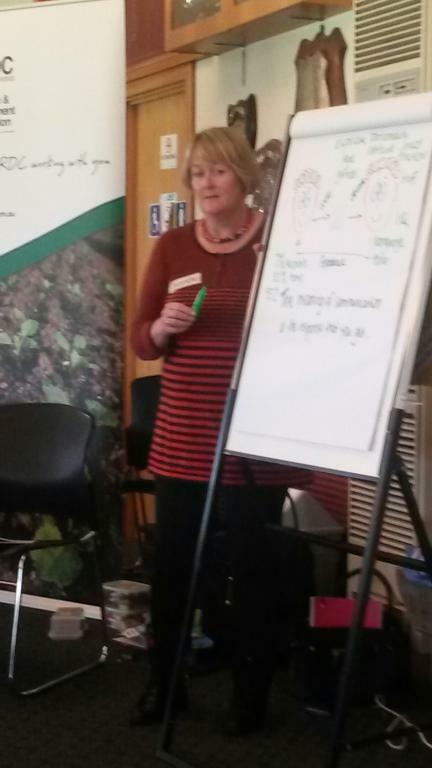 A big thank you to APEN and Andrew Huffer for making the workshops across the country a success. After a slow time with my blog due to a busy workload and a trip overseas I am back on deck, you will be receiving more regular blogs once again. Thanks for your support and ongoing messages which keep me motivated.